Swiss Ski Club of New York - Val d’ Isère - A week with the SSC in the French Alps! Val d’ Isère - A week with the SSC in the French Alps! Payment: by Quick Pay by Chase Zelle (payments made to email: Treasurer@SwissSkiclub.org). You need the App in your phone [preferred]; Online via SSC website, or by CHECK. 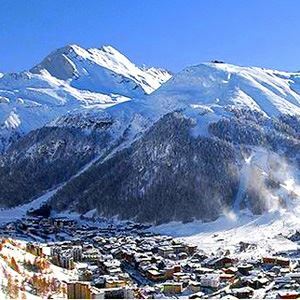 Ski the French Alps with the SSC! RESERVE NOW for $100 early-bird discount!! Thanks to the geographical location, layout of the pistes, high altitude, it’s France‘s most reliable snow with fantastic conditions almost guaranteed. Val d’ Isère is a mecca for all skiers: intermediate, advanced, and off-piste skiers have a huge terrain to choose from; you’ll be hard pressed to ski it all in 6 days. Experts can ski the famous “La Face” – one of the steepest, leg-burning runs in the Alps. Experience legendary après ski spots such as La Folie Douce and Cocorico; featuring live music and amazing shows. Not to be missed! Non-skier or want to take a day off? – Enjoy French food and wine on a sunny terrace surrounded by mountains; experience husky sledding with a pack of dogs; snow shoe on scenic trails amid spectacular peaks; practice your driving skills on ice in a go-kart or a BMW; cross-country ski among wild nature and magnificent views; ice-climb; ice-skate; or engage in retail therapy at some of the 70 shops. Limited number of small (200 sq. ft.) double-occupancy rooms with village views; no balcony. Cancellation policy: Prior to 10/1/18 - $200; between 10/1/18 and 11/1/18 -$900; between 11/2/18 and 12/1/18 - 75% of trip price; after 12/1/18 - 100% of trip price. Trip insurance is highly recommended. The price of insurance is 6% of the trip cost. For more information or to book trip insurance, see Frequently Asked Questions. For important additional details, see our printable Flyer.